Some years back now I experienced significant recovery from Severe ME - MyalgicEncephalomyelitis. 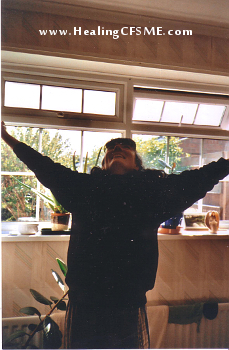 This article shares photographs from the early days after my significant recovery - being able to move and function more freely once again. Touching my toes and then stretching up. I think this was one of the first days after my dramatic improvement. I had only been able to stand a maximum of once a day for the previous 14 years. Yes! After 14 years of not being able to feed myself, I started building up by feeding myself some of each meal. After 5 weeks I had become able to feed myself all of my meals. I had 16 years without cups of tea or coffee. 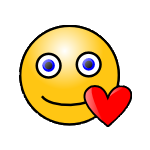 I had little speech and was looked after by carers (caregivers). Most weeks there was someone new. Carers often didn't get to know much about me or take an interest in how to look after me. In order to get everything done in the time, the care routine and menu needed to be set up so that people did the same things each time. Care time was so full and I had minimal speech with nothing spare to ask for something that wasn't on the care routine. Tea is not advised for the management of hypoglycemia so it had to be left out of the diet sheet. I drank hot and cold water for seventeen years, except occasionally when I had a visitor who offered me a cup of tea. This photograph shows that my arms were strong enough to be back to playing the occasional game of Double Patience. I missed that game! 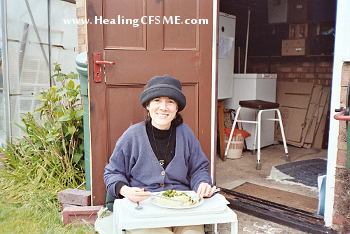 You can see the feet of the indoor wheelchair and the side of the bed in this Chronic Fatigue Syndrome ME photograph. 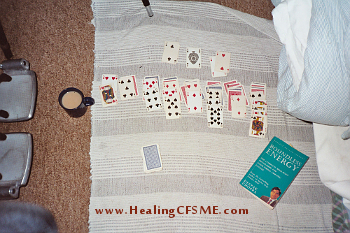 I still couldn't walk much so I played cards right next to the bed. I was well enough to start going out in a wheelchair. 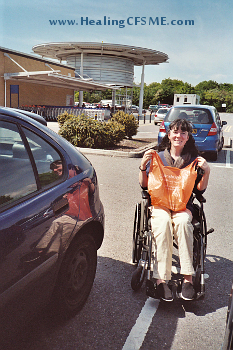 A lovely carer shared my joy as she took me to the supermarket for the first time in 14 years. Still lying down at times! but out and about in the beautiful Wiltshire countryside! I know it's not a good photograph, but I love this one. I walked from the photographer to where you see me. It was amazing to be able to walk that far. 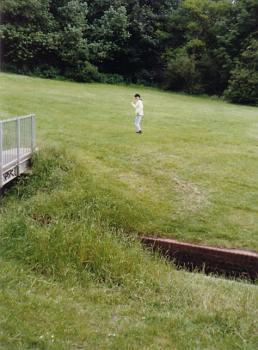 I then walked up my first little hill in a very very long time. The three day Lightning Process was a factor in my significant recovery from Severe ME Myalgic Encephalomyelitis. This is a controversial treatment. Some of you with Myalgic Encephalomyelitis may even be annoyed by its mention. The Lightning Process is a tool. 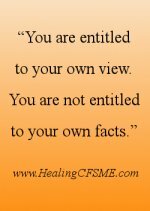 In the hands of someone with COMPASSION and KNOWLEDGE of CFS/ME it can be a wonderful tool. Part of the Lightning Process is to offer you an initial free conversation with the practitioner in whom you have an interest. If this call leaves you feeling worse about yourself then either the process or this practitioner are NOT for you. Please remember that exercise can be dangerous for people with CFS/ME if you go beyond your current safe level. If you become healthy enough to increase your activity, please do so gently. Update. 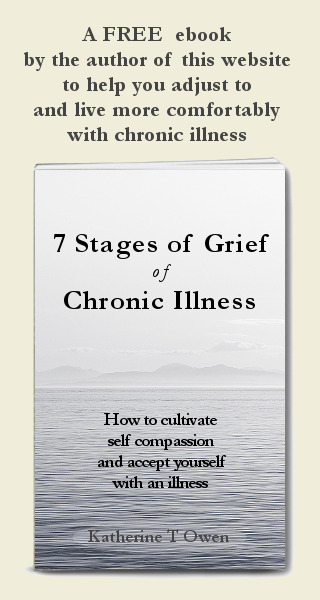 Ten years on from this time of recovery, how is my health? Faith was an important part of my healing journey. The Lightning Process felt like an answer to prayer. Click here for a prayer for healing CFS. For information on other factors that led to my significant CFS Recovery visit my more established website here. 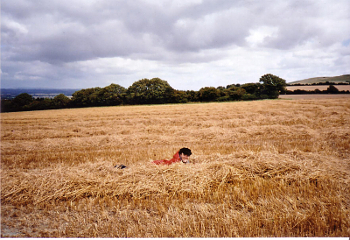 Move from Recovery from Severe ME to see photographs of the years when I was bedbound.